He's scheduled to appear in Milford at 1:30 p.m. In this August, 5, 2016, file photo, vice presidential candidate Mike Pence greets the crowd prior to a speech by Donald Trump in Des Moines, Iowa. Republican vice presidential nominee Mike Pence is returning to New Hampshire for a campaign rally. 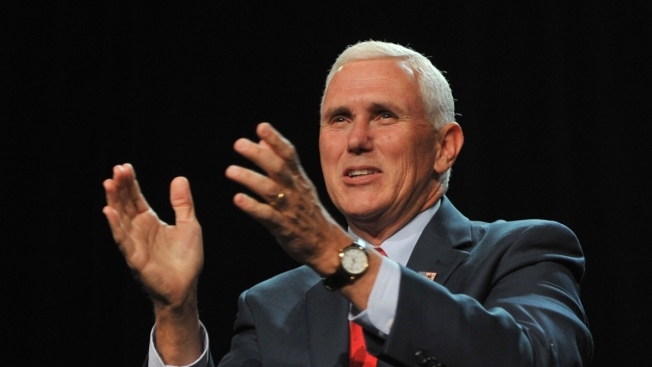 Pence, the governor of Indiana, will appear in Milford at 1:30 p.m. on Monday, just hours before his running mate, Republican presidential nominee Donald Trump, is scheduled to take the stage at Hofstra University for his first debate against Democratic nominee Hillary Clinton. Pence and Trump have each campaigned in the state several times since the summer, as has the Democratic vice presidential nominee, Tim Kaine. Clinton is scheduled to visit New Hampshire on Wednesday, her first trip to the state since July. New Hampshire is a key battleground state in the presidential election, although it offers only four Electoral College votes. Trump handily won the February primary, while Clinton lost to Vermont Sen. Bernie Sanders. Sanders is scheduled to join Clinton at her stop at the University of New Hampshire on Wednesday.